WELLINGTON, Fla. (Feb. 21, 2012) – The fourth annual Equestrian Aid Foundation “Inspection Reception” Fundraiser will be held Thursday, March 1, from 5-8 pm at the Palm Beach Dressage Derby in Loxahatchee, Fla. 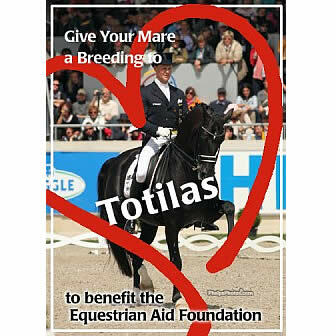 The highlight of the evening will be the live bidding for a breeding to World and Olympic Champion Totilas. To register to bid by phone or text, please contact skursar@gmail.com or call 704.650.1604 before Wed., Feb. 29 at 2 pm to arrange a bidder’s assistant. Only those present to bid or those registered to bid offsite will be eligible to win this exciting opportunity. Guests will enjoy a fabulous meal and drinks at the beautiful show grounds at the Horse Park at Equestrian Estates immediately following the FEI Jog. Courtney King-Dye will be the guest of honor. Items will be on display at noon in the IHS Palm Beach Derby gathering place, “The Beer Garden,” to bid on items or make donations. 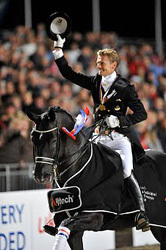 Wellington, FL – January 6, 2012 – Organizers of the World Dressage Masters presented by Axel Johnson Group have been informed that the stallion Totilas and his rider Matthias Rath of Germany will be unable to attend the WDM Palm Beach presented by International Polo Club Palm Beach, which is set to take place January 26th to 28th. Lausanne (SUI), 8 July 2011 – Adelinde Cornelissen (NED) and the 14-year-old gelding Jerich Parzival have taken over the world number one slot in the Dressage rankings. With 2,578 points, the Dutch combination has moved up to claim the top spot on the FEI World Dressage Riders’ Ranking List. 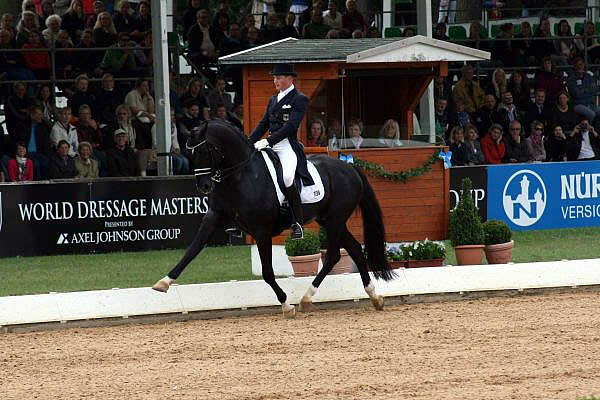 Previously, fellow countryman Edward Gal and the super-stallion Totilas reigned supreme for 19 months from 1 December 2009 to 30 June 2011. Adelinde and Jerich Parzival are followed in the rankings by British duo Laura Bechtolsheimer and Mistral Hojris on 2,465 points. Ulla Salzgeber (GER) and Herzruf’s Erbe are in third place with 2,200 points. 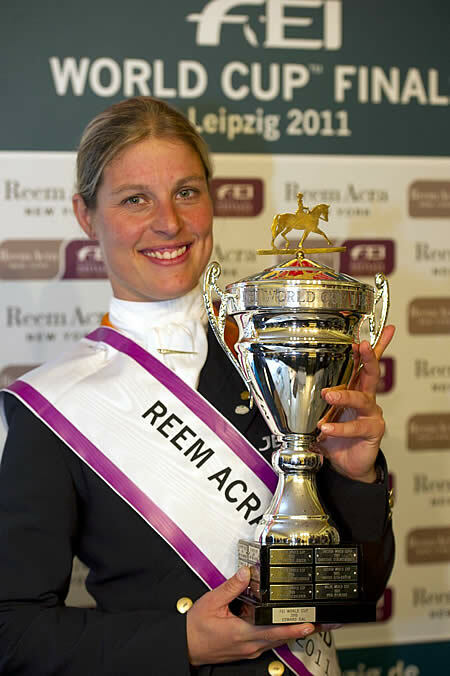 Thirty-one-year-old Adelinde, who was world number one from 1 September to 30 November 2009, is having an exceptional 2011 season, including victory in the Reem Acra FEI World Cup Final in April, the first time in her career that the Dutch rider had claimed the World Cup title. 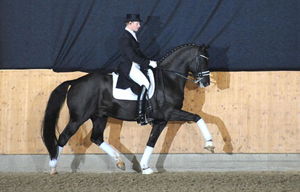 Edward Gal (NED) and Totilas remained as the world’s leading combination after the stallion had been sold to Germany until Totilas had made his first competitive outing with new rider, Matthias Alexander Rath. The new pairing has come in at 165th in the Rankings with 1,108 points to their credit from their four outings last month. Cor Loeffen and Steffen Peters answered questions about identifying talented horses. Photo by Monica Sakurai. Sutherlin, OR – If your goal is to breed, own or ride the next Ravel, Totilas, Judgement ISF, Idocus, or Popeye K, the KWPN-NA Annual Meeting added to your inspiration. With insights from Olympic medalist Steffen Peters and renowned breeder and KWPN judge Cor Loeffen, along with networking with some of the world’s biggest and best KWPN horse breeders, the event was the largest in recent years. Two hundred enthusiastic equestrians gathered in Visalia, California to discuss and debate the best way to produce and manage superstar equines. Matthias Rath makes his debut on the show for an exclusive interview as we get to know Totilas’ new partner, plus our new segment ‘You Be the Judge’ with listeners Robert Dunn and Liz Call. Mary Lauritsen joins me this week right here. This week’s show takes on a different perspective as we hear from people around the world of what they think about the sale of Totilas. 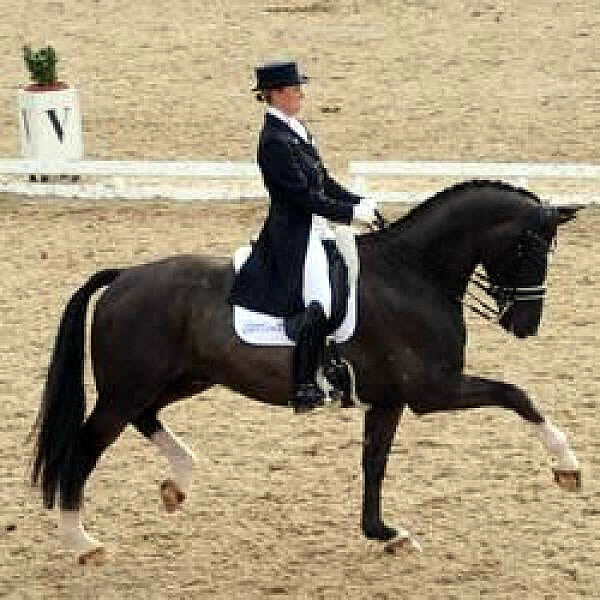 Has a dressage horse ever stirred up so much emotion? Hear for yourself what the world has to say.